Located along Shunfu Road, Shunfu Mart Food Centre is over 20 years old, and has been churning out good food for residents living around Shunfu Estate and the neighbouring areas. 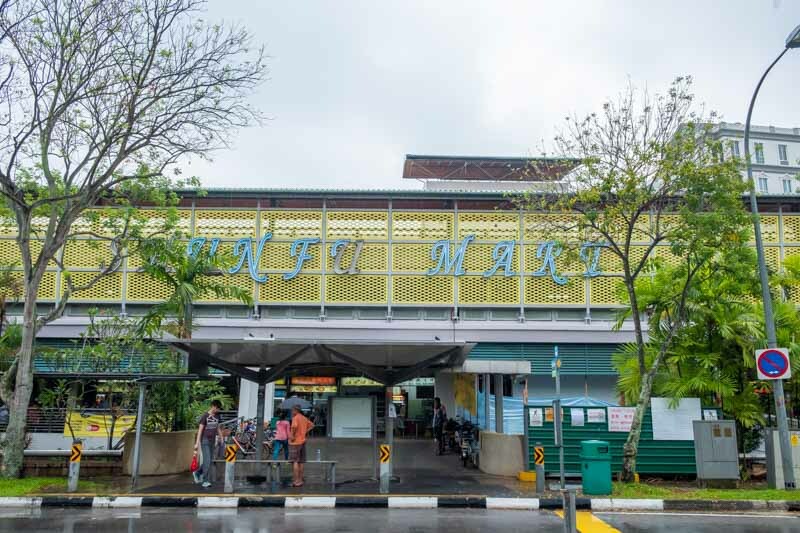 Just a short walk from Marymount station, this food centre is hard to miss due to the bright yellow grill that spans across the top of the building. As the saying goes, “old is gold”, and this humble eatery sure does sparkle with hidden gems. Here are 8 stalls to try when you are at Shunfu Mart Food Centre. Chocolat N’ Spice 晶品美食西点 is no stranger to the muffin scene. Their affordable and delicious muffins are the key to their success. I patronise their stall frequently and the quality of their pastries remains consistent. We decided to try out their bestselling muffins, the Chocolate Chips Muffin ($1.30) and Blueberry Muffin ($1.50). Both muffins did not disappoint, proving why they’re the bestsellers. The muffins were rich in flavour, and they weren’t as sweet as those from other bakeries. After I sank my teeth into the slightly crispy crust, the moist pastry and the filling was begging for me to take a second bite. This was also the first time I tried their Chocolate Walnut Brownie ($1.80) and it was simply amazing. The chocolate wasn’t too sweet and crumbled in my mouth, yet it didn’t dry out my mouth either. If you’re itching for a sweet treat, try their muffins and brownie. The aromatic chicken immediately caught my attention when I passed by Leong Hainanese Chicken Rice良海南鸡饭. There were newspaper articles all over their board, which suggested that their chicken rice was really good; I immediately knew I had to try it! While it looked like a normal plate of Chicken Rice ($3), it actually had a plethora of flavours. The fluffy rice, soaked in ginger and chicken stock, was adequately fragrant on its own. Chewing on the chicken was a delightful experience; it was soft, tender, and juicy. The beansprout was well-cooked and gave the dish a welcoming crunch. For $3, there was a generous amount of chicken paired with well-seasoned rice. I would say this meal is worth every cent. Craving for some popiah? Satisfy your cravings at Heng Heng Bao Bing 兴兴薄饼. The Popiah ($1.40) is cheap and good, with soft and thin skin. Despite its soft texture, the skin didn’t tear when I lifted each piece. The filling was sweet and crunchy, thanks to the sweet sauce and beansprouts. If you are looking for a light bite, have a popiah! One of the more popular stalls at Shunfu Mart Food Centre, Lai Heng Fried Kuay Teow & Cooked Food 来兴炒果条 • 熟食 has a constant line of customers queuing up. Known for their moist Fried Kuay Teow ($2.50/small, $3/large), the serving portion even for the $2.50 plate was quite sizeable. The noodles were smooth and well-coated with the sweet fragrant sauce. You can also add on an Otah ($1) to beef up your meal! If you’ve not tried a wetter version of Fried Kuay Teow, this is a must-try. Known for their Soon Kuey ($1.20/piece, minimum two pieces), Mei Zhen Hakka Delicacies 美珍客家美食 sells yummy food that works well as side dishes. While the skin of the Soon Kuey is thin, it still remains as chewy as its thicker-skinned counterparts. The ingredients used include turnip, dried shrimps, and mushrooms, working harmoniously to bring out all the flavours. Apart from Soon Kuey, there are other dishes too such as Yam Cake ($2/small, $3/big) and Glutinous Rice ($2.20/small, $3/medium, $6/big). If you aren’t sure which you’d like the most, the only solution is to try them all! Stop at two? A mountainous task when faced with such great temptations. I remember when I was young, my parents would bring me out for breakfast and without fail, I would always choose to have economic noodle. 30 Economic Bee Hoon & Nasi Lemak 经济米粉 • 椰浆饭 rekindled that memory. Depending on your preference, you can choose to include other side dishes; I opted for Bee Hoon & Kuey Teow, Cabbage, and Egg ($2.30). The noodle wasn’t as oily as it looked, it was actually very light on the taste buds. The egg was fluffy with an oozy centre, and the vegetables were soft and sweet. This made a good breakfast meal because the flavour wasn’t too heavy on the palate. Just next to the famous Lai Heng Fried Kuay Teow stall, Lai Heng Mushroom Minced Meat Noodle 来兴香菇肉脞面, serves tasty yet affordable Minced Meat Noodle ($3.30). If you noticed, both stalls share the same name because they are owned by the same owner. This no-frills Minced Meat Noodle packed a punch; the noodle was springy and well cooked, with a distinct vinegar taste that didn’t distract from the flavour of the dish. There was a generous amount of minced meat and pork slices, which were very tender and not overly gamey. How could you say no to a comforting bowl of noodles? If you are still hungry after looking at seven varieties of food, perhaps this will send you running towards Shunfu Mart Food Centre. Another popular stall, Quan Ann Prawn Mee 全安虾面 serves up piping hot bowls of Prawn Mee ($3). Though the broth wasn’t as salty as I’d like it to be, you can always add a dash of soy sauce to make it more flavourful. The prawns were fresh, and the pork slices were tender. The crisp crunch of the tao geh also added more texture to the dish. Just thinking about it now is making my stomach growl. Do your taste buds a favour, and try out this hearty bowl of prawn noodles!